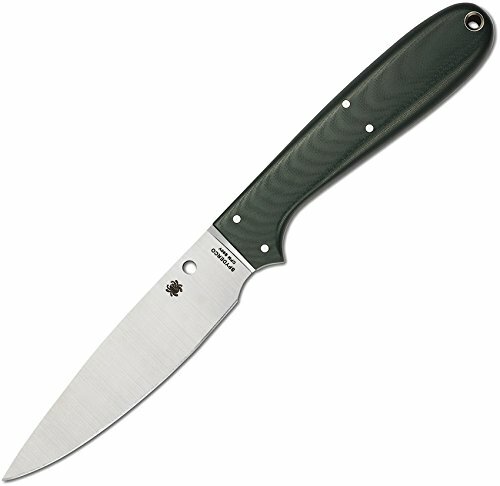 Purpose designed for processing small game and fish, the Sprig is custom knife maker Phil Wilson's second collaboration with Spyderco. Based on his popular bird-and-trout design, the Sprig is ground from premium CPM S90V particle-metallurgy stainless steel. This advanced alloy is made with a generous amount of vanadium, which encourages the formation of vanadium carbides within the steel for increased wear resistance. This translates to an exceptionally keen and long-wearing edge that is ideal for extended use in the field. CPM S90V also has a high chromium content, giving it excellent corrosion resistance and making it very easy to maintain. Like Wilson's handmade knives, the Sprig features a full-flat grind and distal taper that create outstanding edge geometry for friction-free cutting performance. For maximum strength and deft balance, the Sprig's handle features a full tang flanked by contoured forest green G-10 handle scales. The beautifully finished scales are permanently secured to the tang with multiple pins and a tubular lanyard hole that allows easy attachment of a lanyard or safety cord. Wilson's signature integral guard ensures a secure, comfortable grip and helps prevent the user's hand from sliding forward during use. The Sprig comes complete with a custom-molded Bolt Aron sheath and an adjustable G-Clip attachment that offers a wide variety of carry positions. Light, handy, and offering scalpel-like control, the Spyderco Sprig is an outstanding example of the bird-and-trout breed of knife and a must-have tool for every serious outdoorsman.